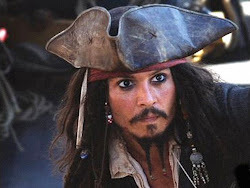 Snippets of Jack: "They've Come To Kidnap You"
"They've Come To Kidnap You"
We first catch a glimpse of The Black Pearl, in The Pirates of the Caribbean: Curse of the Black Pearl. But at this point, Barbossa is still captain and Jack is thirsty for revenge. It all seems like a quite, peaceful night, but one by one the people of Port Royal can tell that a dark spell has been cast on their city. Elizabeth is in bed when her light suddenly flickers and is blown out. Will is still working at the at the blacksmith's when some pretty haunting music begins to play. He looks outside the window to the foggy alleyway. Norrington and the governor are walking along the fort discussing Norrington's marriage to Elizabeth. Weatherby also notices the change in the atmosphere: "Ghastly weather, don't you think?" Norrington: "Bleak. Really bleak." Governor: "What's that?" And then the first cannon is shot, right into the port. Newly Commodore Norrington instructs the solders to "Return fire!" Meanwhile, the shot can be heard in Jack's cell. As you can assume, this gets him very excited. Jack: "I know those guns. It's the Pearl." Prisoner: "The Black Pearl?" Other prisoner: "I've heard stories." First prisoner: "She's been preying on ships and settlements for near ten years. Never leaves any survivors." That sounds enjoyable. Jack: "No survivors? Then where do the stories come from, I wonder." Dead men tell no tales. This seems to stump the other prisoners. All out war has begun against Port Royal. The Black Pearl continues to hurl cannons at the settlement, all in order to get that one piece of cursed Aztec gold that hangs around Elizabeth's neck. Buildings begin to fall and people flee for their lives. However, this doesn't seem to do enough damage because they still need the last piece of gold to set the Black Pearl free from the curse. So they begin to take row boats onto land to kill some more people, and being immortal, they are pretty good at it. Will grabs his weapons from the blacksmith's shop and goes to help defend his town. Back at the fort, Norrington and his men are trying hard to take the down the Pearl, but they are failing badly. Norrington: "Sight the muzzle flash. I need a full spread, fore and aft. Mr. Stevens, more cartridges. Governor, barricade yourself in my office. That's an order." Norrington is taking control! Pintel and Ragettie, crew members of the Black Pearl, make their way to the Governor's palace to find the medallion and maybe scrape up some more gold. Elizabeth, who sees them coming up to her house, tries to warn the butler not to let them in, but it's too late. He's shot and the pirates are after her now. As she tries to run away, the maid stops her. Maid: "They've come to kidnap you!" Elizabeth: "What?" Maid: "You're the governor's daughter!" Elizabeth thinks that they want to hold her hostage for ransom, but really they want more than that: her necklace and her blood to sacrafice. Elizabeth does a pretty good job in delaying Pintel and Ragetti, but it's madness inside the house and servants are being killed everywhere. Elizabeth, who is too weak to get the sword of the wall to defend herself, takes refuge in a closet. At first, the pirates think that she escaped from the window, but since their pirates they can sense that the medallion is near them. Pintel: "We know you're here, poppet." Ragetti: "Poppet!" Pintel: "Come out. We promise we wont' hurt you." This statement doesn't fool Elizabeth, but it tricks Ragetti, who doesn't understand why they would kill all the people in the town and hunter her down just to let her go. The Ragetti realizes that Pintel is just trying to trick Elizabeth. Pintel: "We will find you, poppet. You've got something of ours, and it calls to us. The gold calls to us." That's when Elizabeth realizes that it's her little trinket that they want. Pintel and Ragetti have also realized that she's in the closet because of the crease in the carpet in front of it. Ragetti: "The gold." Elizabeth examines the necklace in the light coming from the crack. When she looks up, Pintel's beautiful eye is staring straight at her. Pintel: "Hello, poppet."